Quadriceps or rectus femoris is perhaps one of the largest muscle groups in your body and should be trained with the same intensity as your biceps femoris or hamstrings. Quadriceps are extremely important for any athlete and should be trained in compound movements to maintain symmetry with your hamstrings. 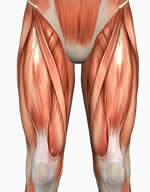 The function of the quadriceps or Rectus Femoris are for knee extension and hip flexion. The origin of the quadriceps attach onto the Illiac Spine of the Ilium and the lateral, anterior and medial surface of the femur. The quadriceps insert onto the patellar tendon of the Tibia. Training recommendations for the quadriceps should consist of many major compound exercises such as the squat, lunge, jump squat, and deadlift. DeadLift To begin the Deadlift stand with your feet shoulder width apart and while keeping your back straight bend at your knees to pick up the barbell (with an alternate hand grip).